"Yes! Actually works" What is that supposed to mean? They don't look like they do anything. Return of the petite ponies? LOL love how someone commented that they are "pooping out their tail"
They aren't wrong. The G4s do that too. The hair looks bad. I really hope they fix those tails. It's going to drive me bonkers if they don't. I would buy them if not for that. Those look super fun collectibles, and would make for perfect cellphone straps. I wonder if we have that toyline in Europe, I've never paid attention to it. I foresee my cats knocking those off my shelf and under the sofa. They are very cute if a bit odd looking. Another Malibu Stacy with a new hat, sigh. Can we ninja our way into hasbro and unplug the evil main six xerox machine? Guess that's what happens when Rainbow Power fails. It is odd that they would do the tails only. It would both make more sense and look better if it was both the mane and the tails. But oh well, I'm not really interested in them anyway. I literally laughed when I saw these, I mean...come on this feels like a joke at this point. Does Hasbro honestly expect anyone to be excited about this? This is their big toy reveal for the summer? If this is the big thing to keep an eye on how boring is the rest of the line going to be?? They look like bath toys that should be packaged with a cheap shampoo in a cheap gift pack. Rainbow dash doesn’t even have proper rainbow hair. The bottom half of her hair is just blue. In a line that emphasizes rainbows. Oh well, I guess I don’t have to worry about space on my G4 shelf! Clearly I won’t be buying much more from this generation! But of course Twilight has rainbow wings. So that makes it all all right. 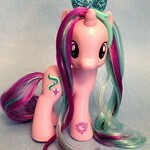 An ugly imitation of the much prettier Rainbow Curl pony concept, I feel...Rainbow Magic's wings look much better. This probably won't ever get here, as stores are still struggling to sell the stuff from the last movie and surrounding gimmicks, but I have to admit, even by current G4 standards, this is pretty lame.